On our 2 acre property, we have something fun for the kids and young at heart. We have a fenced-in play area, a horse shoe pit, basketball court, 145 feet of beach front with a play gym, floating raft, paved bike trails, snowmobile trail across the street, and laundry room. In the winter, we have an ice skating rink and a perfect sledding hill. 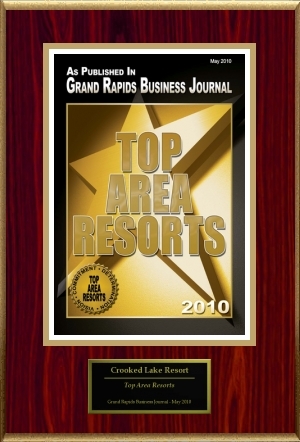 We Have Been Awarded The Top 10 Area Resorts In Michigan. From The Grand Rapid's Business Journal. Awards for: 2007, 2008, 2009, 2010, 2011, 2012. Last 5 Original Log Cabins In Michigan. 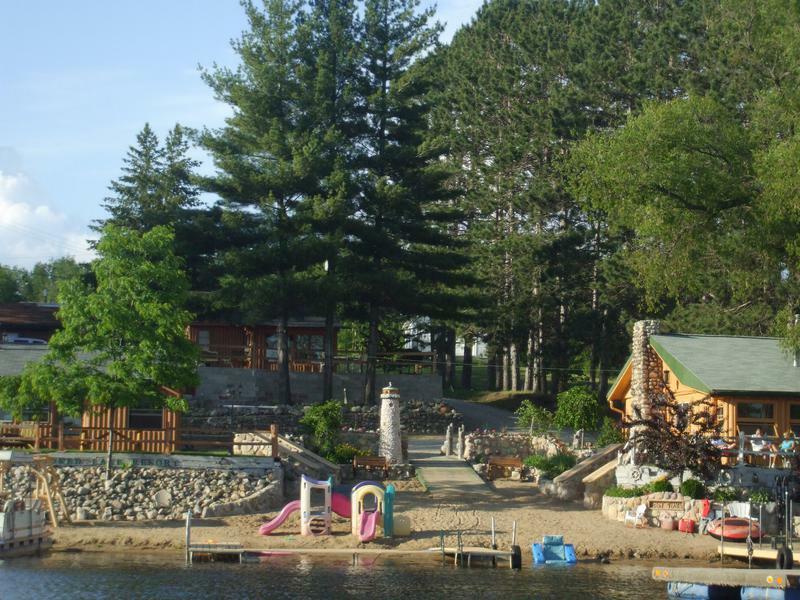 Winter, Spring, Summer or Fall - Crooked Lake Resort has it all! 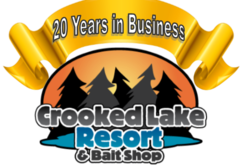 Welcome to Crooked Lake Resort & Bait Shop, located in Lake Station, Michigan. 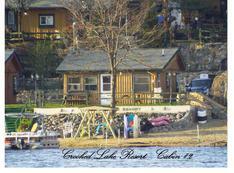 We have 6 log cabins on Crooked Lake. 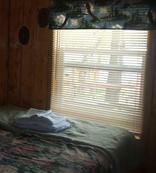 We have luxury cabins with 2, 3 and 4 bedrooms. Cabins sleep from 2-10 people. The resort sleeps 41 people in total. It is a fantastic place for family vacations, reunions, weddings, honeymoons, and more. Our lake front log cabins are completely furnished with full kitchens including microwaves, full size refrigerators, stoves, coffee makers, toasters, dishes, pots, pans and silverware. Living rooms include comfy sofas and chairs. Bathrooms have a shower or bath tub. Dining rooms have a table that seats 4-6 people. Bedrooms are complete with twin and/or full size beds. Linens and pillows are provided. Cabins also have a sun porch and private yards that include their own fire pits, picnic tables, charcoal grills, and lawn chairs. 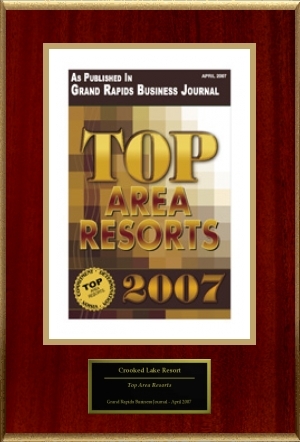 Crooked Lake Resort is located on Crooked Lake in Lake Station, Michigan. The lake is 264 acres in size with a maximum depth of 73 feet. 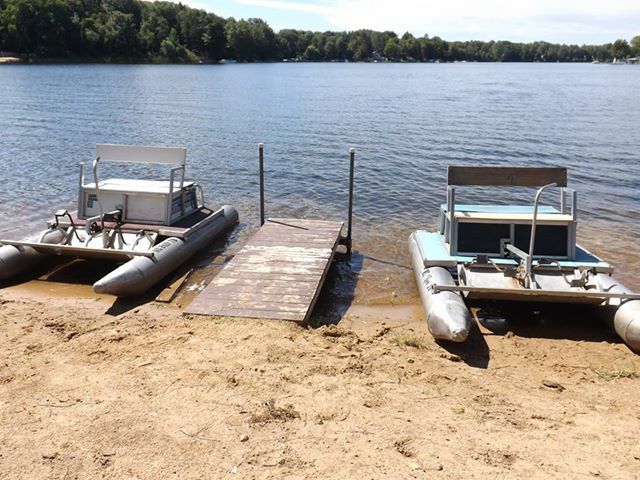 It is an all sports lake for fishing, tubing, water skiing, and parasailing. It has a sandy/peat bottom and contains Pike, Large Mouth, Small Mouth Bass, Rock Bass, Blue Gill, Perch, Crappie, and Sun Fish. Cabin 1 is a lakefront log cabin. It is 400 square feet in size. 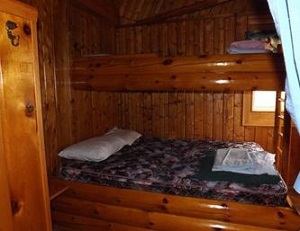 The cabin has 2 bedrooms and a twin size sofa sleeper. It will sleep 6 people. The lakeside bedroom has a full size bed. The second bedroom has a full and a twin size top bunk. The living room has a twin size sofa sleeper. All linens and pillows are included. Wood burning fireplace, furnace, full size kitchen with gas stove, living room and dining area, and a Sun porch. Bathroom with shower. Paper towel and toilet paper is also provided. Towels and soap are not included. Cabin 2 is a lake front log cabin. It is 400 square feet in size. 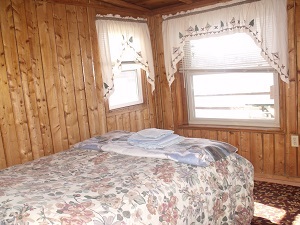 The cabin has 2 bedrooms and a twin size sofa sleeper. It will sleep 6 people. The lake side bedroom has a full size bed. The second bedroom has a full and a twin size top bunk. The living room has a twin size sofa sleeper. All linens and pillows are included. Wood burning fireplace, furnace, full size kitchen with gas stove, living room and dining area. It also has a Sun porch. Bathroom with shower. Paper towel and toilet paper are also provided. Towels and soap are not included. Cabin 3 is a lake front log cabin.  It is 500 square feet in size. The cabin has 3 bedrooms. It will sleep 6 people. The lake side bedroom has a full size bed. The middle bedroom has twin size bunk beds. The third bedroom has a full size bed and a twin size bunk. All linens and pillows are included. Wood burning fireplace, furnace, full size kitchen with gas stove. Living room and dining area. Bathroom with tub and shower. It has a sun porch. Paper towel and toilet paper are also provided. Towels and soap are not included. Cabin 4 is 500 square feet in size. 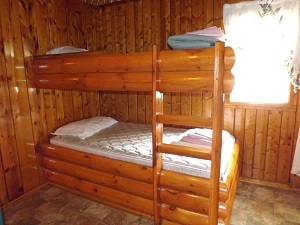 The cabin has 3 bedrooms. It will sleep 6 people. The lake side bedroom has a full size bed. The middle bedroom has twin size bunk beds. The third bedroom has a full size bed and a twin size bunk. All linens and pillows are included. Wood burning fireplace, furnace, full size kitchen with gas stove. It has a living room and dining area. Bathroom includes a handicap accessible shower. It has a sun porch. Paper towel and toilet paper are also provided. Towels and soap are not included. Cabin 5 is 1,050 square feet in size. The cabin has 3 bedrooms and a loft. It will sleep 10 people. The lake side bedroom has 2 sets of bunk beds. The middle bedroom has a full size bed. The third bedroom has a full size bed. 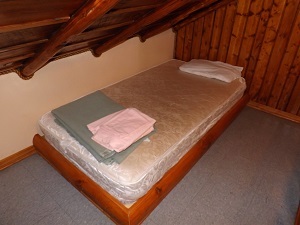 The loft has two twin size beds. All linens and pillows are included. Gas burning fireplace, furnace, full size kitchen with gas stove. Living room and dining area. Bathroom with shower. Paper towel and toilet paper are also provided. Towels and soap are not included. Cabin 6 is 1,100 square feet in size. The cabin has 3 bedrooms. It will sleep 6 people. The lake side bedroom has a full size bed. The second bedroom has a full bed. Third bedroom has a set of bunk beds. All linens and pillows are included. Wood burning fireplace, furnace, full size kitchen with electric stove. Living room and dining area. Bathroom with tub and shower. Paper towel and toilet paper are also provided. Towels and soap are not included. Our bait shop has a full line of bait and tackle. We carry night crawlers, baby crawlers, neon crawlers, trout worms, wax worms, leaches, perch minnows, sucker minnows, mousies, spikes, and decoys. We sell DNR licences, hunting supplies, wood, pop, candy, and chips. Winter: Snowmobiling, ice fishing, log cabin lodging, water park nearby, hunting, Christmas parties ice skating and skiing. 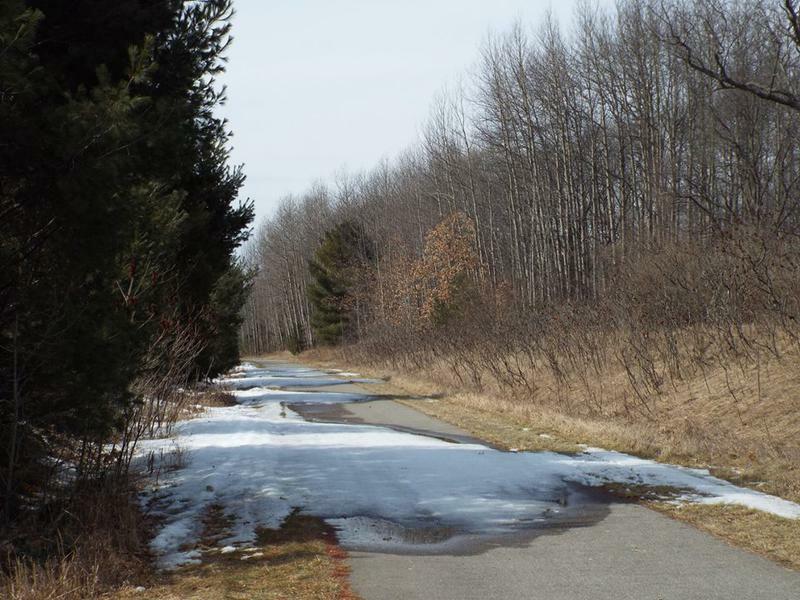 Spring: Mushroom picking, fishing, nature walks on the Pere Marquette Trails located across the road, biking on the trails, golfing, zip lining, casino, boating, water park, campfires and BBQ's. 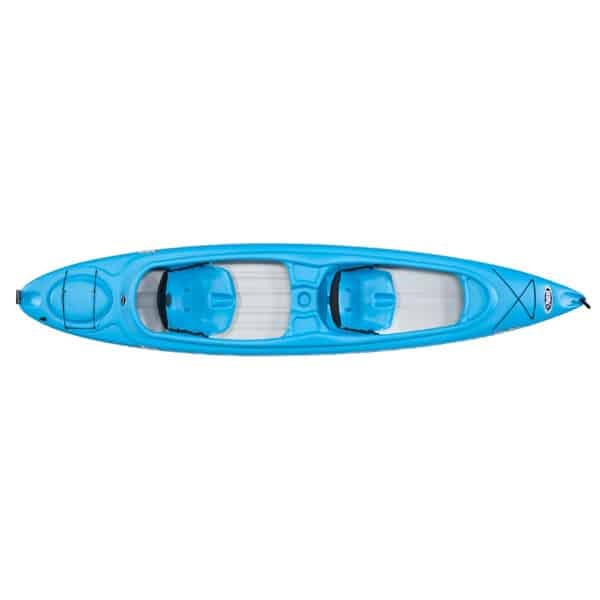 Summer: Fishing, boating, biking, nature walks, canoeing, swimming, water park, golfing, casino, zip lining, campfires and BBQ's. Fall: Hunting, fishing, fall colors, casino, water park, bike or walk the trails across the street. Cabins 1, 2 & 3 are Lake Front. about 70 feet from the lake. Cabin 6 is just before the white house, it is about 150 feet from the lake. The trails are spotty! Ready for walkers and bikes.